Georgia State filed an incomplete application for a construction permit (Form 340) according to Federal Communications Commission (FCC) public records. The application was filed April 8, 2014 and granted on May 19. Parties to the application, including representatives of Georgia State, were omitted. Georgia Public Broadcasting (GPB) was also not listed despite the new partnership with the university announced on May 6. Discussions and plans of the partnership date back to August 2013, according to open records obtained by The Signal. 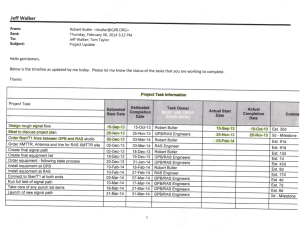 The chart in the document above shows the timeline of the planning starting on September 18, 2013. Several questions addressing legal and financial matters were not answered. Melissa Howard, former general manager of the college radio station WUOG 90.5 FM at University of Georgia, said she had been following WRAS and looking into the applications for some time. Howard said she was driven by the push and decided to look into the FCC filings some more. She noticed there was another application for a permit that was cancelled in April 2011. 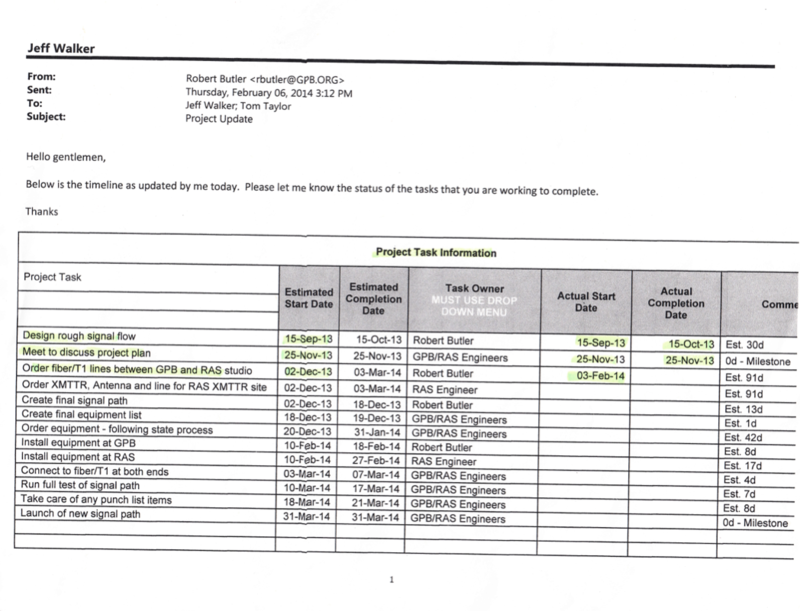 “It just seemed weird… [the April 2014 application] just seems to be so much less informative compared to the one that had been filed previously,” Howard said. She also said historically the FCC has required their applications to be completed in entirety. “Part of that application is to reveal any type of partnership or partnership agreements that exist… and the [parties] were entirely omitted,” Howard said. In Form 340 instructions the FCC states the applicant may leave lines blank only if there is a non applicable option available. In an earlier story by The Signal, Adam Goldstein, attorney advocate for the Student Press Law Center, said Georgia State did not file an application to transfer licensee names when the Board of Regents previously owned the WRAS FCC license. The Regents asserted Georgia State was not a separate entity and therefore did not file a transfer application. “Somewhere along the line, somebody didn’t take a step they were supposed to take,” Goldstein said in an earlier interview. He also said the administration of Georgia State is showing a pattern in behavior in improperly filing applications. Goldstein said there were mistakes by not disclosing that the Regents also had control over the FCC license, not transferring the licensee name, and not disclosing partnership plans with GPB in the application. “It’s starting to look like the thing in Chicago where the woman said her husband accidentally fell on the ice pick 14 times. Nobody has this many ‘happy accidents,'” Goldstein said. The FCC allows anyone from WRAS management to people outside of WRAS management to file a comment or complaint on an issue according to their official website. College Broadcasters, Inc. (CBI) released a press statement in opposition to the GPB partnership on May 20. “I think it’s pretty clear that there has been a lack of transparency throughout this whole process which is one of the main concerns that CBI has,” President Greg Weston of CBI said. Weston said the most important thing for the university to do is really listen to the students and have a process by which students concerns can be heard and given a chance to improve. At this time, CBI has no plans on filing a complaint with the FCC. Howard said she also doesn’t have plans on filing a complaint because she doesn’t have the opportunity to listen to WRAS on a day-to-day basis like the Atlanta community. “I would think that the people who are listening to it… on a daily basis would be the ones to step up,” Howard said. Representatives from Georgia State and GPB could not be reached for comment by press time.